Few would argue that London is the undisputed theatre capital of the world. However most theatregoers focus on the action on the stage and often pay scant regard to their surroundings. This new book ‘London Theatres’ takes readers on a tour of forty-six London theatres with stories of the architecture, the people and the productions by leading theatre critic Michael Coveney and a series of stunning photographs of the public areas, auditorium and backstage by acclaimed photographer Peter Dazeley. Award winning actor Mark Rylance writes the foreword for the book, describing the interaction between the actor and the theatre space. One of the first actions he takes when entering a theatre is to look up at the ceiling, if there is some kind of circular device, he is convinced that the theatre experience will be fine. The book considers 46 London Theatres as they stand in the 21st Century, ranging from the grand Royal Opera House to the lesser known delights of Wilton’s Music Hall. The theatres are divided into chapters that illustrate some of the remarkable diversity of London Theatres, these include Grandes Dames, Palaces of Pleasure, Popular Landmarks, Informal Delights, Legends Alive, Hidden Gems, Eastward Ho! and West End Jewels. Michael Coveney in the book’s introduction considers that to understand many of London’s theatres development, it is important to study the architectural and cultural context. Although for centuries, theatre was a favourite British national pastime, by the 1980s thousands of theatres around the country have been lost. Remarkably, the West End of London has been resilient and constantly reinventing itself, even new theatres have sprung up to provide a platform for different types of drama. Although many of the large theatres are owned by large concerns, they have often spent millions of pounds to restore the decaying fabric of many old theatres. The book begins with the opulence of the Royal Opera House, Theatre Royal Haymarket and Theatre Royal Drury Lane, these ‘Grand Dames’ provide evidence of intriguing history, decorative splendour and more rustic back stage. One of the themes of the book is the contrast between the front and back of house with grandiose design schemes and often Heath Robinson contraptions that create the atmospheric magic from back stage. Peter Dazeley’s remarkable range of photographs take us on a journey in the theatres where often things are not what they seem to be and the glitz and glamour is often a mere façade. One theatre that has redefined the theatre going experience is Shakespeare’s Globe, the wooden recreation of one of the famous theatres from the time of Shakespeare, Marlowe and Jonson illustrate that the connection between actors and audience was not always as clearly defined as modern theatres and the more basic seating or standing can provide a wonderfully different theatrical experience. The connection between audience and actors has been one of the guiding lights of the more modern theatres which have often gone back to basics, Donmar Warehouse, the Young Vic and the Almeida Theatre suggest that it is important to concentrate on the quality of the drama rather than worrying too much about ornate splendour of the surroundings. The book is full of wonderful stories and anecdotes from the theatrical world with the Theatre Royal Drury Lane holding the record for the number of ghosts stalking the building. Often it is the ghosts of the past that make a meaningful connection between theatre and theatregoer. Many of the great actors and actresses of the past have trod the London theatre boards and it often is considered their presence is still there in the memories of the audience and fellow actors. 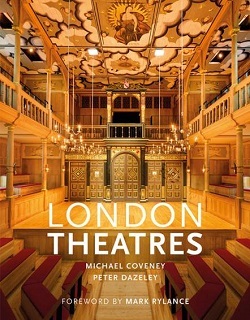 This fascinating and important book puts the selected London Theatres centre stage with the illuminating photographs by Peter Dazeley and intelligent commentary by Michael Cloveley. Generally, because so much time is focused on the action upon the stage, relatively little is written or shown about the part the actual theatre plays in creating the right environment for a successful performance. The nature of theatre and drama is often about illusion and make-believe and this book illustrates the interesting part the theatre plays in this process. Walking into an opulent building indulges the fantasy that you are entering something extraordinary and amazing things will happen on stage. Even the theatres that have gone back to basics are creating a different kind of illusion that draws the audience into the make-believe world of theatre. This intriguing book provides plenty of evidence that the whole structure of a theatre is often as much part of the performance as the action on the stage. By londonvisitors2014 in London Book Review - Non Fiction on August 31, 2017 .